Secretly yours is a Love story with a twist, or should I say multiple twists. But that can be discussed later, as first things should come first. The cover page of the book gives a fair idea of its genre as it depicts a young female looking at her reflection in a somewhat mysterious manner. As I started reading the book, I was instantly addicted to its delicious plot full of dark secrets and surprising revelations. Sahil, a 17 year old boy is on the path of self destruction as his grandmother impenitently blames him for the death of his parents, whom he lost at birth. Then one day, he meets Anya, an enigmatic girl who enrolls in the same music academy where Sahil learns to play guitar. While teaching Anya to play the guitar, Sahil falls in love with Anya, who seems to reciprocate his feelings but then rejects him when he speak about his love. Later Sahil meets with an accident and goes into coma for a month and upon waking is surprised to find that he is able to read the minds of people. He hopes that he can use his new found power to learn what is going on in the Anya’s mind. So, will Sahil be able to unravel the mystery that is Anya? Vikrant Khanna has managed to create a fascinating love story that also covers the various issues faced by teenagers in a generic manner. He has managed to keep up the suspense of the book till the very end making the story totally unpredictable. The characters are described in a decent manner and I was actually not able to let go of the book till I had finished reading the last line. 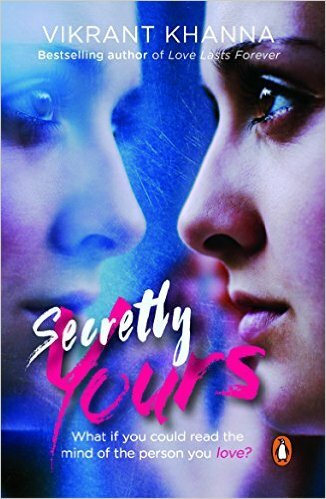 Overall, Secretly Yours is a good book with great thrill and suspense and I wish Vikrant all the very best for its success.